Words that came to mind while I was reading The Pit and the Pendulum – horror, terror, darkness, despair, nightmarish. What a creepy story. Short, yet so effective. As the narrator’s doom literally sinks towards him, I felt glued to the page. My heart beat faster with each painstakingly described moment. The man, his all-white judge and jury, his sentence of death and the delirium that follows, all unbearable to witness, but even in this darkness of thought, he perseveres with a little bit of luck by avoiding the death trap in the middle of his prison. I saw clearly the doom which had been prepared for me, and congratulated myself upon the timely accident by which I had escaped. His captors are not so easily foiled. A new nightmare awaited, much worse than the first. Having failed to fall, it was no part of the demon pan to hurl me into the abyss, and thus (there being no alternative) a different and a milder destruction awaited me. Milder! I half smiled in my agony as I though of such application of such a term. The steel blade of the pendulum perceptibly descended. And still they tempted him with food barely within reach. The rats! His torture was complete, but in the last moment his tormentors were his saviors, and he was free of the bindings that held him in place of certain death. In A Tale of the Ragged Mountains, Poe delves into the truly weird and uncanny with a story about a man named Bedloe who gets lost while traveling in mountain passages on a day out from his home. He finds himself in a dream-like state in a completely different land and time period, caught in a battle with a people the likes of which he has never seen in his life. He believes himself killed in this battle, but then he awakens, and finds his way back to his village, still alive, still breathing much to his amazement. But why was he thrust back into this particular time and place? Was it time travel or reincarnation, or even just an odd dream? All is explained by the end of the story. I had no idea Poe wrote anything thing the likes of which could be called science fiction. If you're looking for some great October spookiness, these stories are thoroughly engrossing and not that hard to read. Be sure to put in your order for dark stormy skies before hand though, thus ensuring you'll never go to sleep again! Ha. I don't like Poe. I know, I'm the only one alive. But then again, I don't Halloween, and I don't like spookiness either. I like a lot of Poe, but the Cask of Amontillado really creeps me out. It's been a long time since I read any Poe. Ack, I love Halloween, but I have a sister born on that day and we've always made a big deal of it, witches and all! 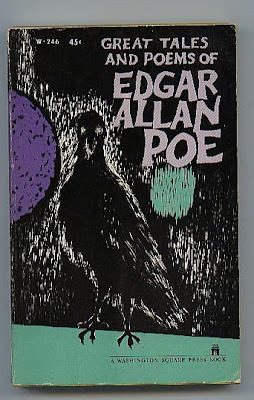 I only like Poe when I'm in the mood for a fright. Otherwise, not so much. I haven't read The Cask one yet. I should put it on my list, maybe read it alone? huh? on a dark and stormy night? Thanks for your thoughts on this one ladies! Been a little lonely around here review wise. Amanda - where's Jason? On a trip oversees? Got the swine flu? Working overtime when he should be reading poetic works? Jason's got two reviews to write, but his second class of the semester just started up so he's running behind. Too much stuff to do. It doesn't help that I'm writing like crazy and he's sort of picking up the slack in the house a bit (the dear). He's also reading Finnegan's Wake and the skeleton key to Finnegan's Wake, so that's taking him awhile. As for Cask - I didn't find it scary, just horrifying in a morbid sort of way. Like pondering what it would feel like to be buried alive or drowned. Sorry! (Hits self with bat) I'll put one up tonight. (Scoops up brains and puts back in head, so he can write a review). Great thoughts on Poe! I love Halloween too. Poe rocks! his stories are great and his style is original. 500 years from now, i think that he will be the most-remembered 19th Century American author. "I had no idea Poe wrote anything thing the likes of which could be called science fiction." I don't think many people realize what a pioneer Poe actually was. They just think creepy morbid guy who married a kid.